DNF at 30%I wholly appreciate what the author is doing with this book, which is why I've chosen to stop here and leave off a rating, as I'm simply not the right reader for this novel. Content Warning to sensitive readers for graphic physical and verbal abuse. Many thanks to the publisher for the opportunity to give this one a try. 4.5 Stars!! Well done Katie McGarry!! 4 Stars!! 🌟🌟🌟🌟 “Pain is what makes you grow, it’s what makes you mature, it’s what helps lead you to the path you are meant to be on. If everything is good all the time, there would never be change.” It wouldn't be a Katie McGarry book, if at some point, my heart didn't explode all over the floor! Mission accomplished Dear McGarry! Only a Breath Apart was a beautiful, emotional rollercoaster. This book was jammed packed with hard topics and it was done brilliantly. The topic of abuse was handle 4 Stars!! 🌟🌟🌟🌟 “Pain is what makes you grow, it’s what makes you mature, it’s what helps lead you to the path you are meant to be on. If everything is good all the time, there would never be change.” It wouldn't be a Katie McGarry book, if at some point, my heart didn't explode all over the floor! Mission accomplished Dear McGarry! Only a Breath Apart was a beautiful, emotional rollercoaster. This book was jammed packed with hard topics and it was done brilliantly. The topic of abuse was handled with such care, and consideration of the reader. The author understands her characters, and writes them so raw and full of flaws- which makes them real and honest. It also had an undercurrent of magical realism which was unique and different for this author. We follow Jesse- who thinks, and has been told all his life that he is cursed. (he has red hair and I couldn't help but think of KJ) If he leaves his family land, something bad will happen, because of the generations of his past. He is no stranger to tragedy. And Scarlett- on the outside she looks like she has everything together... but what is going on in the inside is a dark mystery to everyone around her. Both are dealing with hard issues with major consequences. I loved everything about this book. It made me feel all the feelings in the emotion rainbow. I wanted to jump into the book a few times and knock some sense into certain people. I like when books make me feel along with the characters. Only a Breath Apart, to me- was full of depth. A story about forgiveness and overcoming tragedy. As well as love and hope. I for one, could not put it down. I think this is some of McGarrys best writing yet. If you're looking for a deep emotional connection with characters and a HAE-I totally recommend this one! Release Date: January 22, 2019 Genre: Young Adult Romance Actual Rating: 4.5 starsKatie McGarry has a magical writing ability and she can make any type of reader get lost in her words. 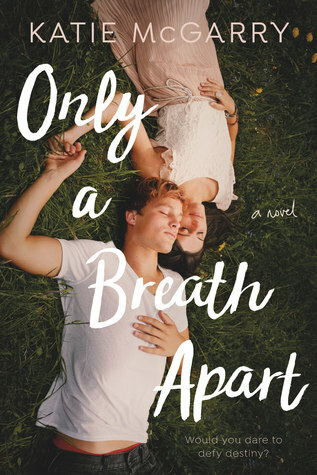 Only a Breath Apart is a stunning and emotional read, one that deals with social issues in a realistic way. This book brought many tears in my eyes but it also made my heart swell. The eloquence in which she writes this profound novel has left a deep imprint in my heart and I am so happy to have taken the time Release Date: January 22, 2019 Genre: Young Adult Romance Actual Rating: 4.5 starsKatie McGarry has a magical writing ability and she can make any type of reader get lost in her words. Only a Breath Apart is a stunning and emotional read, one that deals with social issues in a realistic way. This book brought many tears in my eyes but it also made my heart swell. The eloquence in which she writes this profound novel has left a deep imprint in my heart and I am so happy to have taken the time to read and essentially live within this world. I encourage any reader of both young adult fiction and romance to read McGarry's new release as I think it will leave an impression on anyone who does so. Only a Breath Apart is a story about two people who have gone their whole lives knowing how bad family can hurt those they are supposed to protect. It's a story of overcoming ones past, making their own paths for the future, and hopefully finding love along the way. Neither Jessie nor Scarlett will have an easy road ahead of them, especially considering all the obstacles standing in their way, but the journey is inspiring. I don't want to get into the plot because this here is a book that you need to FEEL without preconceived notions, but I will tell you it's an emotional read. I didn't think the book would have such an effect on my heart, but it did. And in all honesty, I loved it. Fans of McGarry know what I am talking about when I say her books are truly breathtaking and that is no different with this one. Only a Breath Apart is an exceptional read and I highly recommend it to all readers. I received a copy of this novel via the publishers in exchange for an honest review. Just when I thought McGarry couldn't get any better - she does. This had me absolutely spellbound in every way. Ok, this book was freaking amazing. I've had great luck with Katie McGarry books in the past, so I didn't really have any expectation that this would be different. Once I started the book, I was sucked into Scarlett and Jesse's story. I loved seeing them as kids, and their friendship and connection. I loved seeing them come back together, find their way back to being friends and confiding in each other. From the first moment I met Scarlett's parents, I didn't like them. You could just feel that Ok, this book was freaking amazing. I've had great luck with Katie McGarry books in the past, so I didn't really have any expectation that this would be different. Once I started the book, I was sucked into Scarlett and Jesse's story. I loved seeing them as kids, and their friendship and connection. I loved seeing them come back together, find their way back to being friends and confiding in each other. From the first moment I met Scarlett's parents, I didn't like them. You could just feel that something was off..wrong. And of course, you quickly find out what's going on. I really wanted to feel bad for Scarlett's mom, but every time I started to, she'd do something that made me dislike her. I realize that the situation she was in is a hard situation to get out of. But every time she had a moment of clarity, where she made sense, she quickly slipped right back into blaming everyone except the one person at fault. Speaking of that person, I HATED him with a grand passion. Honestly, I kept expecting things to get even worse than what they did. I'm both grateful and a little disappointed they didn't. I am curious about what will happen with Scarlett's sister though. Once Scarlett goes off to college, even though her sister has a way to contact her, it's not like Scarlett is right down the hall anymore. Maybe she'll eventually get a book and we'll get to catch up with Scarlett and Jesse. As for the Jesse side of things...I'm surprised to say that I didn't hate his uncle Marshall as much as I expected to. He was introduced as someone you immediately perceive to be a villain in the story but he ended up being an ally. And a pretty darn good one. Another surprise from the book was the palm reading. I'll admit, I was fascinated by it. I just found it interesting and I'll admit, it kind of made me want to get my palm read just to see what it says. Overall, this book was an emotional rollercoaster and it was FANTASTIC. I can't recommend it enough. 4.5 stars, rounded upIt will take me a minute to gather my thoughts. This felt powerful and real enough that it hit close to home for me. My full review will be posted as part of the blog tour. If you love McGarry - this is a must read. Classic McGarry in every way. I was a little concerned towards the end that it was going one way when it JUST COULD NOT - I was like, NO, you can't even do this, kid. But in traditional KMG fashion, it all worked out. Not that these kids have a smooth road ahead (do any of her characters?) but their lives are much better for having each other. Secrets that lie behind closed doors are often missed by the outside world. For Jesse – the curse that he believes haunts his family keeps love at bay. After losing his mother, Jesse torments himself reliving the moments that brought his mother to that day that forever changed his life. Now the perils of trying to keep the family farm standing weigh on Jesse’s shoulders each and every day. For Scarlett – control and fear are the driving forces in her life. Every factor in Scarlett’s life revolve Secrets that lie behind closed doors are often missed by the outside world. For Jesse – the curse that he believes haunts his family keeps love at bay. After losing his mother, Jesse torments himself reliving the moments that brought his mother to that day that forever changed his life. Now the perils of trying to keep the family farm standing weigh on Jesse’s shoulders each and every day. For Scarlett – control and fear are the driving forces in her life. Every factor in Scarlett’s life revolves around the fear that hovers in her home where her father is concerned. The unpredictability leaves Scarlett and her family walking on egg shells each day. Then there is the over protective and invasive nature that her father interjects into Scarlett’s life. Nothing is off limits for Scarlett’s father. From invading her privacy to having a hand in every personal relationship that exists in Scarlett’s life, her dad just can’t stop trying to have the upper hand in all situations. Jesse and Scarlett grew up together knowing that their lives were not perfect. Both relied on their friendship to overshadow any despair they may face in life. As they matured, so did the problems they faced in life. Then came the day they no longer were friends. This absence of friendship would be revisited once Jesse’s grandmother passed away. A pivotal time in life that would set the course for an old friendship to rekindle once more. Time has a way of mending fractured hearts, and Jesse and Scarlett know this pain all too well. Now they find their futures intertwined in a way they would have never predicted. The only question that remains is just how far the two are willing to go to remain in the other’s life now that their friendship has given each of them the strength to face the demons that haunts their lives. Only A Breath Apart is the journey of two tattered hearts who have lived through a lifetime of hardships. Jesse and Scarlett are childhood friends that find a way back to one another after tragedy once again intervenes in their lives. It’s a story that will hit home for many readers as you follow the journey, but at the same time will give you hope they can work through the hardships and learn to hope once more. The pain and struggles that Jesse and Scarlett endure will grab you by your heartstrings. What trabspires to lead them through life will captivate you and leave you wondering what will happen next. It’s a story that is relatable to many that will delve into their struggles. While I enjoyed this book, I did find the ending a bit more rushed than I would have liked to encountered. There was so much about the struggles these two endured to make it to the ending in that last third of the book. I just wasn’t satisfied with the summarizing. All in all the book is interesting and relatable. Judge for yourself just how endearing Jesse and Scarlett are in one another’s life. "Holes in hearts hurt, and I have too many holes for me to be breathing. Gran poured her love into me, so much, I should have been fixed, but maybe that’s the problem with having too many holes. All the love that’s poured in falls out. "I received an ARC from the publisher via NetGalley in exchange for an honest review. My thoughts and opinions are my own. Any quotes I use are from an unpublished copy and may not reflect the finished product.I'm sorry this is posting so late today! I received my "Holes in hearts hurt, and I have too many holes for me to be breathing. Gran poured her love into me, so much, I should have been fixed, but maybe that’s the problem with having too many holes. All the love that’s poured in falls out. "I received an ARC from the publisher via NetGalley in exchange for an honest review. My thoughts and opinions are my own. Any quotes I use are from an unpublished copy and may not reflect the finished product.I'm sorry this is posting so late today! I received my review copy for the tour a little late, and only finished reading it this morning. I tried to stay up late last night, but my eyes refused to stay open despite how engrossed I was in the story. Katie McGarry never fails to captivate me with her writing, and Only a Breath Apart was no exception. My heart was breaking for both Jesse and Scarlett, and I enjoyed watching them learn to trust in each other again.Neither character has had an easy life, and their secrets are vastly different, but they've always been connected. I don't know if it was something they shared as children, or some connection the land, but there was something that kept these two together. They've needed each other, and their loneliness was painful to read about. They've guarded themselves against the world (with good reason), and it took the two of them working together to penetrate those walls. It's hard to overcome the need for self-preservation, and learning how to love is never easy.I hated the way these two treated each other at the beginning of the book, especially after seeing how much they cared for one another as children. They grew up together, and then something happened to end their friendship. The reason isn't revealed for awhile, and I wish Jesse had been honest with Scarlett from the beginning. He could have told her the promise he made to his mother, and how it contradicted the one he made to his Gran. I think Scarlett would have been understanding, but instead he left her in her own personal hell with no one to talk to.There are some supernatural aspects to this story, but it's subtle. Glory claims to be a psychic and tells Scarlett she is too, but even Jesse just thinks his cousin is exceptionally good at conning people. Glory would read palms and perform tarot card readings, but she also managed to make predictions that had an uncanny ability to come true. It's left up to the reader to determine whether or not they want to believe in something magical, or play it off as a coincidence. I thought McGarry did a wonderful job balancing between the two.I was so angry while I read this book, but it wasn't directed at Scarlett and Jesse. Yes, I wanted them to talk to each other and share confidences, but I also understood where both of them were coming from. I was angry with how the world treated them, and what they had to endure just to get though each and every day. They both had dreams and aspirations, but neither had people that believed in them. Their friends were there, but on the outskirts and never privy to the emotional turmoil they both experienced.Only a Breath Apart was another phenomenal book by Katie McGarry! If you've enjoyed her books in the past, I'm sure you'll love this one even more. If you haven't had a chance to read anything by this author, I highly recommend your grab one her books as soon as you can. I have so many feelings right now, and I love it!Originally posted at Do You Dog-ear? on January 21, 2019. Audiobook Review: 5 Million Stars Katie McGarry always leaves me speechless with her books. I am literally out of words with this book. It’s pure perfection. Yes, it was hard for me to read, very very hard, but still, Only A Breath Apert is one of those books that will stay with me forever. Thanks to the audiobook, I could continue reading while my eyes were wide open, my heart barely stopping and bleeding for these characters. And there were other moments when I couldn’t stop crying and I ju Audiobook Review: 5 Million Stars Katie McGarry always leaves me speechless with her books. I am literally out of words with this book. It’s pure perfection. Yes, it was hard for me to read, very very hard, but still, Only A Breath Apert is one of those books that will stay with me forever. Thanks to the audiobook, I could continue reading while my eyes were wide open, my heart barely stopping and bleeding for these characters. And there were other moments when I couldn’t stop crying and I just closed my eyes and listened to the narrators bring these amazing characters to life. But there were also moments when I just couldn’t stop smiling and my heart was almost out of my chest with all the love I had for Jesse and Scarlett. This story is just everything. I always expect the best of Katie, and I’m happy to say she overpassed herself with this book. So… Only a Breath Apart is the story of two best friends/soul mates who’ve been connected since they were kids but fell apart when they were fifteen years old. During those years, Scarlett and Jesse had to face the intensity and drama of their lives, family problems, financial problems, loneliness and more. But right after Jesse’s grandmother died, all hell broke loose for both of them. But one good thing happened among all the bad: They became friends again. But it wasn’t something they wanted. Glory, Jesse’s aunt, who also was a psychic, told them both they needed to work together to get what they wanted: Jesse wanted his land and Scarlett wanted her freedom. And this is when their adventures re-started. Trusting again in each other, telling each other secrets and fears and understanding that together they would succeed was what Glory— and Jesse’s grandmother —wanted for them and they did. It was beautiful to read how that happened, but it was also painful. Their secrets and fears were heartbreaking but they gave each other strength to face them and move forward and finally find their HEA that they both needed and deserved. Like I said before, the audiobook was my lifesaver with this story. I cried and cried and cried. My heart was aching half of the time and thanks to the audio, I didn’t stop. In fact, I stayed up until 3 am listening to the audiobook because I needed to know what was going to happen next. Brittany Pressley & Graham Halstead did an exceptional job in their performances. Their voices matched perfectly the characters, main and secondary. I particularly loved the voice they made for Glory, they sounded all mysterious, making the story better. I recommend Only a Breath Apart to everyone, even to a person who doesn’t read YA, because this story is simply perfection. Both book and audiobook are flawless, perfect companion. 500% recommended. Find This and Other Reviews At Craves The Angst.I received an eARC from the author in exchange for an honest review.5 HUGE STARS! The Review: I know any time I pick up a Katie McGarry novel, I’m in for a treat I’ll enjoy time and again. I’ve been a huge fan since her first publication, Pushing the Limits. I’ve read that book so many times, it’s embarrassing. And though I’ve taken huge pleasure in many of her books since, I think Only A Breath Apart is her VERY BEST so far!This book slayed me! St Find This and Other Reviews At Craves The Angst.I received an eARC from the author in exchange for an honest review.5 HUGE STARS! The Review: I know any time I pick up a Katie McGarry novel, I’m in for a treat I’ll enjoy time and again. I’ve been a huge fan since her first publication, Pushing the Limits. I’ve read that book so many times, it’s embarrassing. And though I’ve taken huge pleasure in many of her books since, I think Only A Breath Apart is her VERY BEST so far!This book slayed me! Story/Characters... Jesse Lachlin believes he’s cursed, and in order to keep himself safe, he must follow two rules. Don’t love and stay on the land. That’s what his mother taught him from an early age and for most of his young adult life, he believed it. He even went so far as to give up the one person he loved most, but now he needs her help or he’ll lose the only thing he has left - his land.Scarlett Copeland has been betrayed by the people closest to her. It started with the love she thought was supposed to be protective and unconditional but turned acidic and violent. Her second betrayal was when the boy she called her best friend, turned his back on her. Now they need each other in order to move forward but Scarlett’s secrets are buried deep, and she’s not sure she can trust, let alone have faith in the boy who crushed her all those years ago.What a ride! This book ... from the moment it opens up, I was hooked, consumed, enthralled ... you name it. If it meant being glued to the pages and not becoming part of the real world until the last page was read, that’s what I did!Jesse was a breath of fresh air. I adored his character. Salt of the earth, down to his soul - Jesse Lachlin was pure goodness. He had some very adult decision to make and my heart just broke for him at every turn. Life had dealt him a crappy hand but it also gave him love and understanding when he needed it most. He was encircled by a support system he needed when it all came crashing down and I loved how he and his friends were written.Scarlett, aka Tink, was a bright light in the middle of some very dark situations. Even though her life was spiraling out of control, I LOVED this girls strength. Her compassion, her zest for life and her love for herself and her family were inspiring. This author knows how to write a phenomenal hero, but she also knows how to write an equally praiseworthy heroine.And as always, this author gives us a surrounding cast that’s more than just background work. They are an intricate part of the story that breathes color, life, and artistry to an already impressive canvas. I delighted in the scenes with Glory as she weaves a little woo-woo mystic into the story, and I very much enjoyed the “band of misfits” in Tink and Peter Pans circle. I hope we see more of them later on. The Wrap Up: Simultaneously heartbreaking and uplifting, Only A Breath Apart is a beautiful, well-told, inspirational story about courage and hope, about growing up, about learning to love and to trust, even after life has given you reason to do neither. It’s also about learning to love yourself, find your true self and even when you feel lost, learning there is more than one path in finding your happiness.The writing was stunningly brilliant. The characters were hauntingly unforgettable. The story was charming and poignant. And the ending was absolute perfection.Five huge stars for Only A Breath Apart! I received an e-ARC from the publisher in exchange for an honest review. Review and blog tour can be found on *Milky Way of Books**trigger warning for both body and verbal abuse*While this book didn't give me the strong feels I have connected with every other book by Katie McGarry, I really enjoyed Jesse's and Scarlett's stories despite the small hint of a 'curse' and all the emotional trials both had to recover from. I did like Jesse's friends a lot and I hope they'll get their own stories.Desp I received an e-ARC from the publisher in exchange for an honest review. Review and blog tour can be found on *Milky Way of Books**trigger warning for both body and verbal abuse*While this book didn't give me the strong feels I have connected with every other book by Katie McGarry, I really enjoyed Jesse's and Scarlett's stories despite the small hint of a 'curse' and all the emotional trials both had to recover from. I did like Jesse's friends a lot and I hope they'll get their own stories.Despite that, the book should have a trigger warning, because this was a hard and too emotional read for me. Overall you do get the beautiful writing by Katie McGarry who manages to craft a story of love, loss the power to overcome your fears. So first, let me tell you that I knew almost nothing about this book except that I loved the cover. I kept seeing it on Instagram and ended up winning an ARC from the publisher. I read a lot of YA fiction, generally a mix of contemporary romance, fantasy, and mystery. Generally, reads based solely on the cover do NOT go well for me (please see The Hazel Wood from last year which was AWFUL and likely one of the worst books I’ve ever bothered to finish). Halfway through reading this book I would h So first, let me tell you that I knew almost nothing about this book except that I loved the cover. I kept seeing it on Instagram and ended up winning an ARC from the publisher. I read a lot of YA fiction, generally a mix of contemporary romance, fantasy, and mystery. Generally, reads based solely on the cover do NOT go well for me (please see The Hazel Wood from last year which was AWFUL and likely one of the worst books I’ve ever bothered to finish). Halfway through reading this book I would have said I loved it and given it 4 or 5 stars. However, by the end I was kind of over it. The story has a good premise - former friends that fell apart and are both from broken households but fall in love (no spoilers - that’s pretty much on the back cover). But it keeps referencing the one character’s connection to the land in a way that is over the top. It also brings in a supposed curse and fortune telling, which are far fetched for a contemporary romance and don’t add anything to the plot to be honest. If she would have cut out about 50-75 pages of nonsense in the second half of the book, this would have been a 4 or 5 star review. Man, I felt this story and the characters. RTC. 4.5 stars!Katie McGarry knows how to write engaging, heartfelt YA drama, and she has delivered a fantastic read with this book! A beautiful coming of age story with drama, romance and a touch of the mystical, this is the story of two very damaged teenagers dealing with heartwrenching situations, and in doing so, finding out who they are, what they want, and falling in love along the way. It’s a beautiful book with all the feels, and I loved it! “Do you ever wish you were somebody else?” From an 4.5 stars!Katie McGarry knows how to write engaging, heartfelt YA drama, and she has delivered a fantastic read with this book! A beautiful coming of age story with drama, romance and a touch of the mystical, this is the story of two very damaged teenagers dealing with heartwrenching situations, and in doing so, finding out who they are, what they want, and falling in love along the way. It’s a beautiful book with all the feels, and I loved it! “Do you ever wish you were somebody else?” From an early age, Jesse Laughlin was taught two things – to love and respect his family’s land, and that to leave the land would activate a curse that has haunted his family for decades. His tragic childhood only reinforced those lessons and, looked down upon by the two he grew up in, the only peace he found was on the land with his best friend and his beloved grandmother. Following the death of his grandmother, the land is all that he has left and he has a deep love for it – though a stipulation in her will could see him lose his legacy. Scarlett was Jesse’s childhood best friend. She grew up on the property next to his, though with a very different life. The daughter of a well-loved, well-respected businessman in their small town, she was forced to keep her friendship with Jesse a secret from her disapproving father but that didn’t stop her from disappearing out her window whenever she got the chance so that they could run free together. It was an arrangement that continued up until they became teenagers and Jesse broke Scarlett’s heart, deserting her without a word and distancing himself completely. His cruelty left her confused, shattered and alone, and though she has since moved on, she still mourns for the friendship they once had. But that pales in significance to the drama now unfolding in her house as her father’s anger and demand for control spirals out of control, shifting their family dynamic in inevitable ways. Everything begins to change for Jesse and Scarlett when Jesse learns that in order to keep his land, he’ll need to win Scarlett’s approval. With the intervention of Jesse’s psychic cousin, the two enemies are suddenly forced together, told that they need to rely on each other to get through the brewing storm, with Jesse fighting hard to win back the trust of the girl that he hurt so badly. I have nine months to win her over, and it’s going to take all that time to undo what’s happened between us. I loved the dynamic between these two! There is so much emotion between them – good and bad – and their journey as they get to know each other once again, re-establish their friendship and earn and learn trust is beautifully written. “Why did you stop talking to me?” she asks. “After all those years of seeing each other day in and day out, why did you stop being my friend?” She pauses, and I lower my head because each and every word is a paper cut on my heart. “What did I do wrong?”I shake my head because I got nothing. Nothing that will make sense to her. What’s worse, I don’t have anything that makes sense to me. At least not anymore. Each moment with Scarlett and Jesse together is just beautiful. It’s honest, raw, confusing and painful, but the moments of sweetness increase as their bond is re-established and it was so gorgeous to watch. It’s as if the sun has melted off her outer shell and has revealed the girl I once knew, and a woman I want to get to know. And, of course, there is romance. Slow-burning, sweet and innocent, I could feel the shifting feelings between them and I fell right along with them as they bravely followed their hearts and openly explored their emotions. There’s something more than friendship between us. A trust and love that had taken root when we were children, something that has grown, something that once took a wrong turn and had to be pruned. Something that has been allowed to reflourish and is on the verge of going wild. But the romance is just a small part of Scarlett and Jesse’s journeys. Scarlett is dealing with a hellish situation at home and Jesse’s entire future is up in the air. They both have a lot of growing and learning to do, and watching them find their inner strength and deal with it all is amazing! They have each other to lean on, of course, but there is a fantastic cast of side characters helping them on the way and bringing so much to the story. The mystical aspect of the book is there, but it’s minor - at first I was a little wary of how that all was going to play out, but it worked with the themes of the story and I thought it was handled well. It’s Scarlett and Jesse’s individual battles to find their way forward that are the crux of the story, and that make this such a special read. “Pain is what makes you grow, it’s what makes you mature, it’s what helps lead you to the path you are meant to be on. If everything is good all the time, there would never be change. The book deals with some really serious subject matter with themes of violence, murder and domestic abuse, with emotional and physical assault occurring on the page, and the emotional impact of all of that explored in detail. Those scenes are hard to read but the harshness of those moments is softened somewhat by the strength of Scarlett and Jesse, and by their love story which brings a beautiful lightness and had my happily lovesick little heart soaring. “You love me?” …“I’ve been in love with you for as long as I can remember. I don’t remember not loving you.” It’s always been there – as easy and beautiful as the sun rising in the morning. I really loved this story. It reminded me a bit of Pushing the Limits – one of my all-time fave reads and the reason that McGarry is an auto-buy author for me – with some similarities in the story setup and the way it all played out. Scarlett and Jesse are amazing characters and I finished this book with tears rolling down my face at how beautiful it all was, and then when I saw the playlist and quite unintentionally listened to Ed Sheeran’s ‘Perfect’, I started crying all over again. Beautiful. 4.5 stars.An Advanced Review Copy was generously provided by the publisher in exchange for an honest review. This book is in short amazing, It's not a run of the mill YA. This book tackles some serious issues, such as abuse. It's handled beautifully by the author, This book has so much depth to it, the depth of the story, the depth of the characters, all make this book flow seamlessly, The characters have so much to overcome. While not yet adults, they have to make adult decisions. In this day and age, that isn't unheard of. It does show a strength of character. The flow of the book is flawless, there This book is in short amazing, It's not a run of the mill YA. This book tackles some serious issues, such as abuse. It's handled beautifully by the author, This book has so much depth to it, the depth of the story, the depth of the characters, all make this book flow seamlessly, The characters have so much to overcome. While not yet adults, they have to make adult decisions. In this day and age, that isn't unheard of. It does show a strength of character. The flow of the book is flawless, there is always great dialogue and inner dialogue as well. Told in dual pov, this is a heart wrenching all the feels sort of book.